Emory Wesley Woods Hospital has been named a Top Performer on Key Quality Measures by The Joint Commission, the leading accreditor of health care organizations in the U.S.
Emory Wesley Woods was recognized as a Top Performer for exemplary performance in its hospital-based inpatient psychiatry unit by using evidence-based clinical processes that are shown to improve care. Examples of evidence-based practice include: creating a comprehensive continuing care plan or making available a list of the patient’s medications with indications, after inpatient discharge, to the next provider of care. "Providing our patients and their families with quality care and consistent performance is what we strive for every day," says William Such, interim COO of Emory Wesley Woods Hospital. "We are committed to delivering positive patient outcomes through evidence-based care processes, and are proud to receive the distinction of being a Joint Commission Top Performer on Key Quality Measures." Hospitals that were named top performers achieved and sustained excellence in accountability measure performance data for 2012. These hospitals had to demonstrate a cumulative performance of 95 percent or above across all reported accountability measures, among other performance standards. A 95 percent score means a hospital provided an evidence-based practice 95 times out of 100 opportunities. In addition to being included in the recent release of The Joint Commission’s "Improving America's Hospitals" annual report, Emory Wesley Woods Hospital will be recognized on The Joint Commission’s Quality Check website (www.qualitycheck.org). The Top Performer program will be featured in the December issues of The Joint Commission Perspectives and The Source. This month, Emory Wesley Woods Hospital is launching a new model of care for adult and geriatric psychiatry patients, with a focus on patients with anxiety, depression and mood disorders. 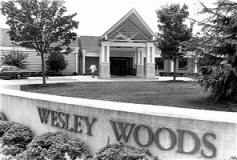 The newly designed adult and geriatric psychiatry units will both be located at Emory Wesley Woods, and staff on the units will be required to possess a specific skill set so they may care for patients on both units.